The mature fruit of Amomum tsao-ko Crevost et Lemaire of family Zingiberaceae. Yunnan, Guangxi and Guizhou provinces, etc.in China. Specially fragrant, pungent, slight bitter. 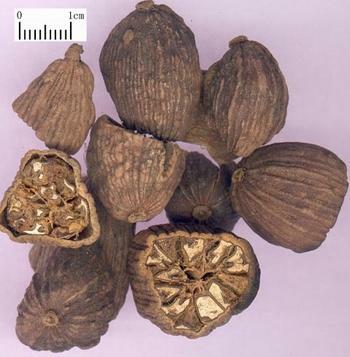 Dry, big, full, red-brownish surface, strongly fragrant. Dry dampness and warm middle energizer, dispel phlegm and check malaria. It is drastically pungent, warm in property and strong in smell. It is the essential herb for the syndrome of obstruction of cold-damp in spleen-stomach for its strong actions of drying dampness and warming middle energizer. For gastric and abdominal cold pain, vomiting, hiccup and turbid-greasy tongue coating due to preponderance of cold-damp, it is usually combined with the middle-energizer-warming and vomiting-arresting herbs such as Wu Zhu Yu, Gan Jiang, Sha Ren and Ban Xia. It also can be used for diarrhea due to obstruction of cold-damp in middle energizer. It can remove turbidity with fragrance, warm spleen and dry dampness, dispel phlegm and check malaria. It is suitable for malaria due to cold-damp preponderance or cold-phlegm accumulation in middle energizer. For high fever with chills, it is usually combined with Chang Shan and Bing Lang. For malaria of preponderance of heat over cold, it is usually combined with Chai Hu and Huang Qin. For malaria of preponderance of cold over heat, it is usually combined with Fu Zi and Sheng Jiang.